Is there a nursing shortage in Louisiana? SOUTHWEST LOUISIANA (KPLC) - According to the Bureau of Labor Statistics, employment of registered nurses is projected to grow 19 percent - faster than the average of any other occupation. The Louisiana Center for Nursing reports that could mean a major shortage of nurses. And with the economic growth Southwest Louisiana is experiencing, will the demand be met? "All the predictions economists and workforce demands are showing that the supply of nursing is going to be challenged and it's going to grow more in the next 2-5 years, said Peggy Wolfe, dean of McNeese State University's College of Nursing and Health Professions. 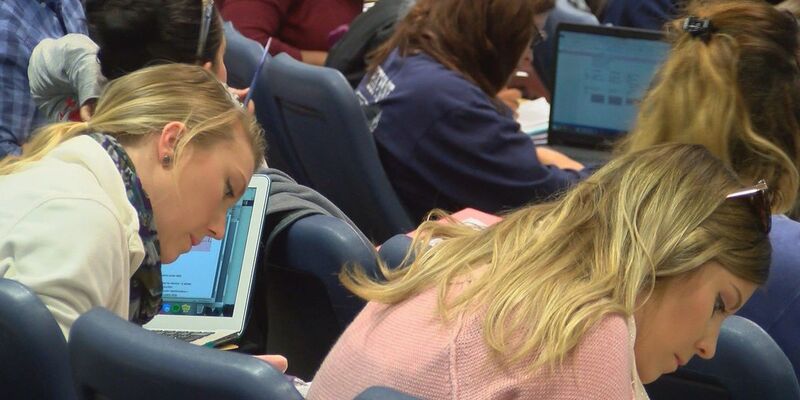 In 12 weeks, another batch of McNeese State University nursing students will enter the workforce. "Very much looking forward to graduation," said Jessie Dupre, a senior nursing student at McNeese. Wolfe said their timing couldn't be better, "The job market is very good." While demand for nurses is high - with the industrial expansion in Southwest Louisiana projected to draw in some 50,000 people in the five-parish area, according to workforce development officials - will there be enough nurses to go around? Combine that with Gov. John Bel Edwards' recent announcement to possibly slash $131 million to higher education, Wolfe is concerned with keeping qualified instructors. "I am concerned that the budget continue to allow the faculty that are needed," said Wolfe. But perhaps the biggest challenge are those retiring. "I think that report spoke to 34 percent of practicing nurses today will retire within the next one to 10 years," explained Wolfe. Despite students facing a higher GPA (now 2.7 in science) for admission and a tougher curriculum, those in the nursing program said it's worth it. "The faculty, I have confidence has prepared us beyond belief for mental, physical, spiritual and emotional challenges," said Dupre. And many students in the nursing program said they plan to stay local. "I have an externship contract with Lake Charles Memorial Hospital so I plan to work with them after graduation. I'm really excited for that," said Chassiddy Williams, another senior nursing student at McNeese. Senior Garrett Laughlin added, "You know there's so many opportunities for us and hospitals are competitive right now, competitive pay. Just a great place to be right now Lake Charles, Louisiana." While that's good news for Southwest Louisiana now, only time will tell if we can meet the ongoing demand for nurses, long-term. Wolfe said enrollment has leveled out in large part because their Associate Degree program (two-year program) - which carried about 300 students - will end this fall and transfer to SOWELA.